→Tyme Iron Reviews : Perfect Beauty Tool For Women – Should You Buy? Tyme Iron is a high-quality hair curler and straightener. It is claimed that the appliance is highly efficient and perfect for all of your styling needs. This two-in-one product is very flexible. Tyme Iron as seen on Tv is faster than any other hair tool available in the market. This styling tool takes less than 10 minutes for mid-thickness, mid-length hair. Read here our detailed Tyme Iron Reviews 2019, to understand more about this product. You can also read Tyme iron reviews on Amazon. As per its official website (“tymestyle review“) following are the Tyme Iron. 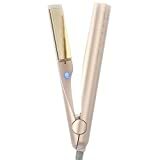 Heats to 400 degrees F.
Tyme Iron is a good looking hair tool and comes in Rose Gold color. Its design is very sleek. It heats very quickly, can saves time, especially when you are in a hurry. It is very easy to use, once you get used to using it! The Tyme Iron is best for thick, coarse hair and does straighten and smooth very quickly. There are no fiddly controls which you have to deal with, just an easy-to-use on and off button. It’s not entirely easy to use the tool. However, once you do get used to it, you will enjoy the results. There is no auto shut-off feature, so always off the tool when not in use. Tyme Iron As Seen on TV looks small in size but it is thicker and has a rounded barrel. It is perfectly designed to create big curls, loose beachy waves, tiny ringlets, or poker straight hair. This product helps the women to create beautiful curls in very less time, as well as efficient in hair straightening too. It is claimed to achieve this due to its extraordinary design and the gold-plated titanium plates. Gold-plated titanium plates are more efficient to produce a “higher negative ionic charge and also very efficient in transferring heat to the hair.” The units warm up to 400 degrees, but there is no heat setting. The one side of Tyme Iron is used as a straightener, and the other one is used to curl. Some customers said that the product is not working the same way as advertised. But the customer care services of Tyme Iron is very active and always willing to help its usersTyme Iron does not have an auto-shutoff feature which is another disadvantages.The cord length is large enough, that you can use it without worrying about pulling it out of the wall. The curls achieved by Tyme Iron are beautiful, but may not hold as long as those achieved with some other devices. If you are not getting the perfect results as you expect, then try curling less hair at a time. We have found that some of its users were trying to curl too much at once, that’s why they were not getting the desired result. STRAIGHTENS BETTER: The rounded design of the rotating barrel and tourmaline ceramic heated plate prevents creasing and crushing that can flatten hair, while the ionic bristles brush and polish strands to reduce frizz and deliver maximum shine. MAXIMUM SALON STYLE. MINIMUM EFFORT. : The larger surface area of the 1.25" round barrel (versus a flat plate) strengthens heat recovery, allowing MAX to maintain a consistent high heat of 425°F for maximum speed and styling efficiency. PROFESSIONAL STYLING: With 360° of straightening power, the MAX Rotating Styler is preferred over flat irons for straightening and controlling frizz, while adding body and shine. USE ON ALL HAIR TYPES: With 4 Heat Settings 285°F, 315°F, 385°F, 425°F, use on all hair types: long, short, thinning, thick, coarse, curly, straight, and frizzy. Also has a 6' Professional Swivel Cord and Automatic Shut Off. MAXIMUM VERSATILITY: The revolutionary design of the 1.25" two-way rotating barrel straightens hair and gives you the option to easily add curl, body, and shine. Tyme Iron is made up of high-quality materials, and mostly gets positive reviews form its users who learn to use it properly. The price of the product is high and the feature is average. But it is totally up to you. I hope this Tyme Iron reviews 2019 help you to understand more about this product. You can also read customers Tyme Iron Reviews on Amazon. Original authentic TYME Iron by TYME with gold-plated titanium plates for optimal results. Heats to a consistent and steady 400 degrees, with a rotating swivel cord for ease of use. Includes the TYME Traveler Heat Sleeve, so you can take your TYME Iron on the go. Create any hairstyle in minutes, from loose beach waves to tight ringlet curls and anything in-between! Free video session with one of our virtual stylists, so you can master your TYME! Hair Styling tool is the must have device for today’s generation. You can use This Tyme Iron as a hair straightener as well as curler. The cost of the product is not too high so you can go with this product.